here are two generations of the Parker Classic pen. 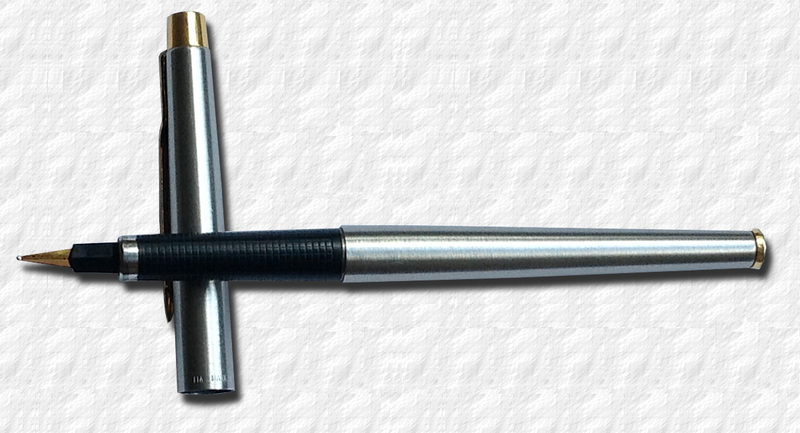 The first generation was a ballpoint pen and pencil, introduced in 1967, called the International Classic. It was a slim, very well balanced pen, intended as a sort of a rich man’s Jotter. Ball pens were beginning to be really in vogue and Parker needed a pen that could both capture the high end ball pen market and function as a companion to the top line fountain pens. Parker decided to give the new ball pen a mode name of it’s own and there were no fountain pens produced in the International Classic line. It followed the design of the immensly popular fountain pen Parker 75, including the Sterling silver Cicelé and Vermeil Cicelé; gold plated sterling silver. The clip had a newly designed Parker Arrow clip, with the longitudinal arrow an integral part of the bottom of the ”feathers”, like an elongated Y.
n 1968, encouraged by the success of the Parker 75 Spanish treasure in 1966, Parker decided to make the Space Pen, an International Classic limited edition pen that had the push button made with metal from Friendship 7, piloted by John Glenn, the first american to orbit the earth in 1962. The pens were made to commemorate the ten-year anniversary of NASA. The metal came from the "Atlas" rocket booster, salvaged in Africa. Only 250 ball-pens were made and these were solely used as gifts for heads of state and high-ranking NASA officials. Needless to say, John Glenn also received a pen. In 1971 a Flighter (an all stainless steel) version was added to the line. It had chrome trim (CT). t had been a long tradition with Parker to offer a ladies alternative to their pens and in 1975 the Parker Lady was launched. Ladies pens were usually smaller but the Parker Lady was of the same size and design as the International Classic, save the finish. a design to become very popular on other models in the mid 1980’s. In 1978 two new designs were added to the model, the Gold plated Fine Barley design called the Imperial and the Silver plated Insignia, which had a pleasing straight line design that was very distinct. By 1981 the model name Parker Lady was dropped. In 1982 a Flighter with GPT was introduced as a ballpoint and pencil and from 1983 on, the pens were advertised simply as Parker Classic, dropping the "International". Parker Classic GT fountain pen. Flighter GT and Flighter CT ballpens. 14k gold nib was replaced with a gold plated stainless steel nib. This was also the nib design on the Classic. The Classic was about 135 mm long when closed and 9.5 mm wide. It had a steel ring at the end of the section. n 1989 a Matte black 22 k goldplated Classic Desk pen was added to the line. y 1993 the Gold Plated Grain d’Orange and Gold Plated Perlé had been discontinued and the new Parker gold plating method, referred to as the Diamonite, an alloy of 50% gold and 50% titanium was offered on the trim of the Laquered Thuya, Sterling Silver, Flighter GT and Matte black models. n 1994 only the Matte black and the Desk pen was offered as fountain pens. The Classic line was not featured in the 1995 product catalogue, nor the 1998. According to Jim Mahmoulian the Classic surfaced again as a ballpoint and pencils in the 2001 catalogue. In 2003 it was gone again. This could however be discreapancies between the US and European markets.